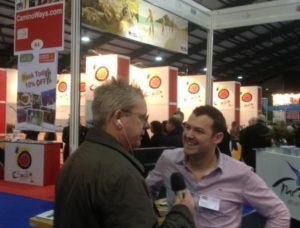 CaminoWays.com, the specialists on Camino de Santiago tours, will be exhibiting at the Holiday World Show 2014 in the RDS Dublin from Friday 24th until Sunday 26th January. Come to talk to our travel consultants at stand K5. We have special discount coupons available for our customers so you can get 2 for 1 tickets to visit the show.This coupon means two adults can enter for just €7, instead of €14 without the coupon. If you are organising a group or charity trek, contact our sales director Jeremy Perrin to arrange tickets to come and talk to us. Our director Roland Monsegu will be also taking part in a talk panel on Saturday 25th January at 12pm, focusing on Walking Holidays, where he can answer any questions you might have about the Camino de Santiago, Via Francigena, advice, training, etc… don’t miss it! -Information and advice about the Via Francigena, Italy’s Camino, starting in Canterbury and finishing in Rome. -We are specialists on walking and cycling holidays on the Camino de Santiago, Via Francigena and other exciting trails in Europe. -We are offering 10% off to Holiday World Show visitors booking during the show. -Enter our mailing list and be in with a chance to win a 2-night stay in Santiago de Compostela. -Get advice on the right route, preparation, equipment and walk duration for you. -We’ll also have specialist fitness advice on Saturday and Sunday from D-Peter Health & Fitness Clinic. -Our hand-picked comfortable accommodation (no hostels with snoring neighbours) from the classic family guest-houses and small hotels to our newly launched Superior Collection featuring luxurious accommodation along the Way. -And our personal and friendly touch! Or visit the CaminoWays.com and FrancigenaWays.com travel team in our office in Dublin city centre.